I know, I know! Ghosts are supposed to be scary, or at least semi spooky, but my ghosts prefer to smile. They must not know they are about to be eaten! We actually went out to lunch with my MIL earlier for my birthday, so a snack box was more than enough. After making it and taking the picture, I realized the crackers could be stabilized a wee bit better, so added some extra cheese cubes. Faith has cheese and veggie crackers. Each piece of cheese is a little different--a pumpkin, a cat, a ghost and a crescent moon. I decided the ghost had to be on top, so he got cucumber peel eyes and a smile. Next to him, on the pumpkin pick are some roll ups of deli ham. To the right, we have another spooky ghost and some strawberries. Below them are some carrots and cucumber pumpkins (I would have made ghosts, but the pumpkin shape keeps more cucumber together), then to the left of that are some pretzels and a little container of dip for the veggies. 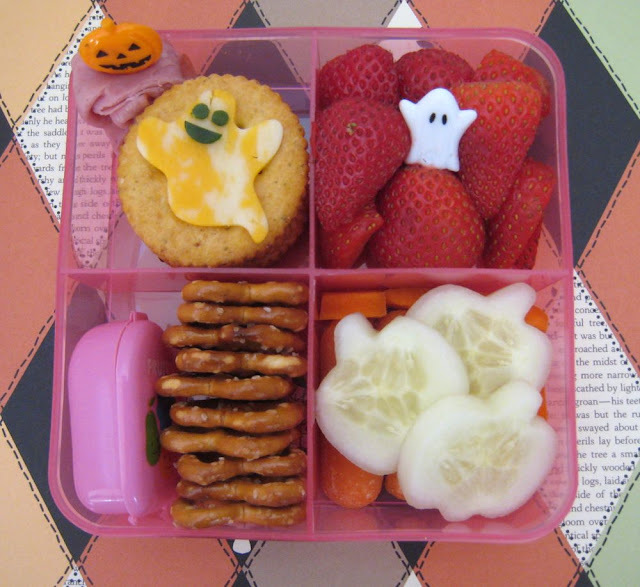 Can you tell I'm totally getting into the Halloween bentos? Decorating the house too, just dragged in all my huge decorations, and heading to do the outside once Shaun gets the lawn mowed. Smiling ghost is cute too. I love that fruit pick! I love the smiling ghost!! I can't wait to start making some Halloween bento :D We're dragging out our decor this weekend too! Shannon, you are too great! I can't believe how creative you get. Do you have cutters for everything you do or are those free handed? Love this box- Halloween brings such great inspiration! I know that this is a very old post, but by chance do you remember where you got your square box from? I am having the hardest time looking for a square with 4 compartments that aren't crazy expensive or stainless steel. Target Dollar Spot, but guessing probably around summer 2010 (based on the post date).